Find Elizabeth, CO New Homes for sale. View Photos, Maps and MLS Data Now! This is a very nice home in a great location. MLS#6667385. COLORADO HOME AND RANCH. Land Is Priced To Sell, Call For Details. MLS#3425088. Redefy. Visit Wildpointe.com - more lots and models available! MLS#9896327. Redefy. Visit Wildpointe.com - more lots and models available! MLS#2870881. Redefy. Visit Wildpointe.com - more lots and models available! MLS#6026541. Redefy. Visit Wildpointe.com - more lots and models available! MLS#4258927. Redefy. Sun Country Meadows - Take advantage of the 18-hole championship course that Spring Valley Golf Club has to offer just mins away! Country living at its finest! MLS#9021184. Equity Colorado. (taxes are estimated due to not yet fully assessed) MLS#6242411. MB JD AND ASSOCIATES. 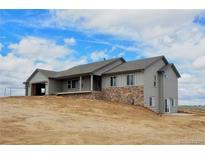 Spring Valley Ranch - 1-acre sites to choose from, more info at www.newvisiondp.com MLS#4276444. Porchlight Real Estate Group. Elizabeth Acres - Call listing agent for more information. MLS#5074601. HomeSmart Realty Group. Lot premium IS included in this price. MLS#5885333. Redefy. Steps away from the community park. East facing driveway! MLS#1913825. COLDWELL BANKER RESIDENTIAL 24. Very close to the community park! Don't wait! MLS#2704983. COLDWELL BANKER RESIDENTIAL 24.